Tom and Carol Olson had owned Bluejacket, a Dutch-built double-ended motor yacht, only a few hours when a nasty storm birthed by a far-away hurricane did its darnedest to sink her in Lake Erie. Huge, spike-like seas quickly formed, as unexpected early October winds pummeled the lake in 1995. Tom later would say they resembled the stiff peaks of meringue on a pie. Waves broke over the bow of the 48-footer, sweeping the deck and rolled the rails under. The eastbound Bluejacket was only a chip in an exploding sea. Carol was sick and a friend on board as crew was caught off balance and thrown against a bulkhead, suffering a bloody cut on his forehead. Tom closed the wound with a butterfly bandage while struggling to hold the yacht on a least-damaging course. "We had left the Detroit River and were into Lake Erie when we were hit by the tail end of Hurricane Opel," he said. "The winds caused steep, sharp seas. We were taking water over the boat. We were burying the rails on both sides because of rolling and periodically the bow tipped under." The boat was new to them, but the Olsons were not new to the sea. Years of sailing and ocean cruising gave them the skills to cope with storm conditions. Although she was being badly abused by the weather, Bluejacket gave them confidence. "The boat gave us a tremendous sense of security," he added. "There was never a sense the boat was troubled. But it sure was a lot of work to hang on." As Tom recalled the adventure later, I was reminded that thousands of vessels-yachts, fishing boats, squarerigged sailing ships and large freighters-have gone down in the Great Lakes over the last several hundred years. Many disappeared without a trace in storms like the one that pummeled Bluejacket. The old Gordon Lightfoot song, The Wreck of the Edmund Fitzgerald, started playing in my mind as Tom talked. The Fitzgerald, a bulk carrier loaded with iron ore, sank without a trace in a storm on Lake Superior in November, 1975. Some of the Lightfoot lyrics were appropriate to the Bluejacket adventure: "When the gales of November come early...came the wreck of the Edmund Fitzgerald." There would be no mournful ditty for the Bluejacket or its crew because she would escape "the gales of November come early." The full displacement, steel-hulled yacht staggered on through the storm for hours, testing all the seagoing skills of the Olsons and their friend until they found calm waters in Put In Bay on South Bass Island, about 30 miles southeast of Detroit. Until a couple of years ago, Tom and Carol Olson of Bainbridge Island, Washington, had never owned a boat larger than a 26&apos; Thunderbird. But their experience went far beyond the lively little sailboat. They had chartered larger, cruising sailboats for summer vacations; he had served as crew on racing boats on Puget Sound and in several Victoria-Maui races. While a college student, Tom worked summers on Foss tug boats running between California and Alaska as an oiler and deckhand. Later, he took time from his career as a Seattle attorney to deliver fishing boats to Alaska for thirteen seasons. Although they were dedicated sailors, there had always been some subconscious thinking about powerboats. 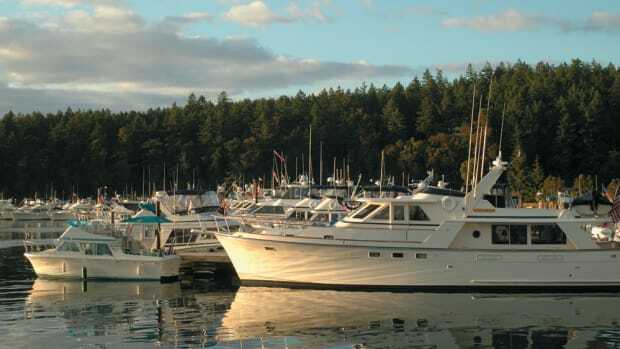 One summer, Carol and a friend were arranging a charter for a sailing vacation for the two couples in British Columbia. "I said, what if we chartered a powerboat and didn&apos;t tell them," she remembered. Ever faithful to the wind, they signed for a sailboat. Around that time they began looking for new challenges and new directions for their lives. There was a need to do something different, a change. One evening in the summer of 1995 they were in bed reading, and Carol looked at the boating magazine in Tom&apos;s hands and pointed at an ad. "I like the looks of that," she said. He challenged her to call the brokerage advertising the boat. "And I did," she said. "That" was Bluejacket, a double-ended motoryacht built by Lowland Yachts in the Netherlands. Lowland, a commercial yard, launched four of the small ships in the mid- 1980s as its first venture in pleasure boat production, and one or two came to the United States. Today, Lowland is a major custom builder of large yachts, 65 to 135 feet. Bluejacket, unforgettable because of her dark blue hull and gleaming white pilothouse, was completed in 1984 for an American who kept her in Annapolis on Chesapeake Bay and in Florida. Her second owner moored her in the Detroit River, where the Olsons first saw her in September, 1995. And by then they owned her. Or, as Tom said later, "by then she owned us." After Carol took Tom&apos;s dare and made the call, the selling broker sent them a video and information about the boat. Sensing he had serious buyers on the line, the broker suggested the Olsons tie up the boat by making an offer even before they saw her. They did just that, making completion of the deal subject to a personal inspection and subsequent approval. With a satisfactory surveyor&apos;s report in hand, they flew to Detroit in September for their first look at Bluejacket, a boat that was already theirs unless they found something terribly wrong. "They agreed to take care of a couple of small points and we agreed to buy it," Olson said. "We even arrived with bags of stuff we wanted to leave aboard. They knew they had us." The Olsons returned to Detroit on October 6 to sign sale documents, and take possession. And to prepare for their fateful shakedown cruise. Their intent was to head down the U.S. East Coast, through the Gulf of Mexico and the Panama Canal, then up the Pacific Coast to Seattle. Bluejacket is a mini-ship. Loaded with fuel and water, she weighs 60,000 pounds. But graceful lines conceal her bulk, though. The fantail stern is classic and hints of 1920s yacht design, and Hollywood lovelies posing on deck in white lace and big hats. The fantail shape allows comfortable seating around an adjustable table in the cockpit. Her living accommodations are below decks, suggesting a sailboat heritage. Her raised pilothouse is far aft and safe from crashing seas, meeting a major design criterion for passagemaking under power. You walk through wide doors from the cockpit into the pilothouse, which has captain&apos;s chairs for both the skipper and lookout. The view is clear all around the horizon. The view is even more expansive if you open the sliding sunroof in the pilothouse overhead. There&apos;s a second sunroof in the saloon. They looked like a sure source of leaks to me, but Tom Olson said they are tight and dry. Not even a Lake Erie storm could squeeze water through their seals. A stairway left of the helm station curves down five steps to the saloon. This boat is more than 15 years old, but the teak-and-holly sole, the teak trim, cabinetry, and the original white settee and chairs all look new. Windows and the sunroof flood the saloon with light. Forward and down a couple of steps is the oval-shaped galley and eating area. This is a curvaceous place. The port-side galley is a half circle, with teak cabinets curved to fit. Even the front of the freezer and refrigerator have been built to match the radius of the circle. Curves and circles have become design cliches on some contemporary production yachts. Lowland certainly wasn&apos;t the first to use that styling feature, but the Dutch builder has done it with taste and class. The dining table is on the starboard side, and again the seating curves around the table. The table will convert to a bed sized for kids, but the Olsons don&apos;t use the space for sleeping. The galley is small, but the arrangement allows off-duty crew to gather comfortably around the table and sip coffee and tea while watching the cook at work. I know, because Tom and I shared table space while Carol prepared a lunch of sandwiches, fruit and brownies, as we three talked boats. Farther forward is a guest head, to starboard, and a small stateroom with a berth that will sleep one comfortably and two very closely. The master stateroom and head are aft of the saloon and also down a couple of steps. Remember now, Bluejacket has a pointy stern that dictates the shape of the stateroom. So don&apos;t be surprised to see that the cabin is roughly triangular in shape, coming to a point at the stern. There is a berth on each side, with a row of small windows high on the outside walls. Because the pilothouse deck and cockpit are above the master cabin, the stateroom ceiling is low. A basketball player would not fit, but nearly everyone else will. While a double-ender is a beautiful boat, the design sharply limits the amount of living and storage space in aft quarters. That&apos;s why contemporary yachts have broad, squared-off sterns-they allow huge aft staterooms with island queen beds and generous storage areas. Even Lowland gave up the fantail design. A series of 51-footers that followed the 48s have broad, flat transoms. They look like big Dutch bottoms. The tightest spot on board is the engine room. The entry is through a door in the master stateroom. One goes in on hands and knees. The single Volvo engine, a 255 horsepower TAMD60C, sits amidships, while a 15kW Westerbeke generator is athwartship on the forward bulkhead. The generator has a hydraulic pump that operates the 17hp bow thruster and a hydraulic get-home motor that will push the boat at about 4.5 knots. Normally, Bluejacket cruises at 8.5 knots with the Volvo turning 1,850 rpm. At an estimated burn rate of 3.5 GPH, her 750 gallons of fuel give the yacht a range of about 1,800 miles. The engine room is one of four below-deck watertight compartments. 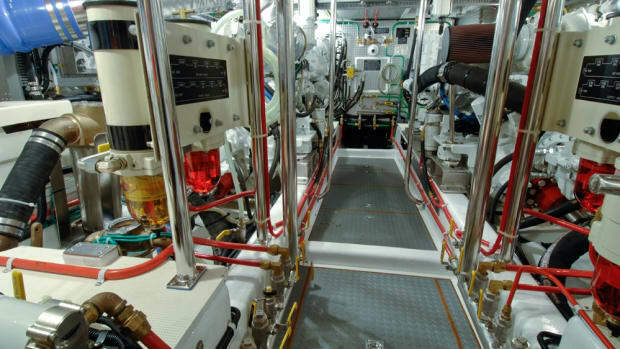 Each compartment has an individual bilge pump, and, in the engine room, there is a manifold that allows the skipper to direct the flow from each space overboard or to a spigot on deck. The engine room is essentially a water-tight box, unless its ventilators are submerged. The other compartments, Olson explained, have bulkheads like those on the Titanic. They are watertight, but don&apos;t reach full height. If one compartment filled with water, there could be flow into an adjoining space. With a green main engine, a red generator and red valves on the bilge pump manifold, the engine room is a festive place. Thick insulation keeps engine noise out of the living spaces. All told, Bluejacket is a one-of-a-kind yacht for the Olsons. Their extensive experience at sea told them that she was what they wanted. There&apos;s enough of a sailboat in her lines to make a sailboater comfortable. But with her Volvo diesel, raised pilothouse and comfortable deck spaces she satisfies the cruising needs usually only found in a powerboat. "This is sort of a compromise," Tom agreed. "It&apos;s a boat we could cruise on and it&apos;s one a sailor could be happy on without too much embarrassment." Things that looked good to Olson: "The lines, the way she was built, the substance of it, the mechanical systems. "I was interested in the boat because I could go places and not be concerned about conditions. One of my goals is to go back to Alaska, on my own in my boat. This is an appropriate boat for that." Has she lived up to expectations? When the boat reached Puget Sound Olson put her in a yard for bottom painting. The yard sandblasted all of the old paint before applying new. Because of delays, some corrosion began to appear and was covered with paint. Much later, corrosion worsened beneath the bottom paint and rust began to show. In a later haulout, in a different yard, the damage was apparent. Again the bottom was sandblasted, but workers primed the raw steel immediately. The pilothouse and trunk cabin also were painted and on a sunny day one needs sunglasses to look across it. Roll chocks of half inch steel are welded to Bluejacket&apos;s round hull, but Tom believes active fin stabilizers would have done more to reduce rolling in the Lake Erie storm, and in other rough conditions on the way home. Carol predicts stabilizers will be installed. The Olsons spent a day at Put In Bay cleaning the boat and recovering from the beating by fringe winds from Hurricane Opel. They made a 24-hour run east on Lake Erie to Buffalo, New York, and the entry to the 350-mile-long Erie Canal. Bluejacket spent nearly a week moving east through the canal, which was built in 1825 to link the Atlantic coast with the commerce of the Great Lakes. They passed through 36 navigation locks while Bluejacket&apos;s crew admired colorful foliage on trees lining the canal&apos;s banks. Antennas down, she just squeezed under bridges. Tom said: "Under one bridge, we were going very, very slowly-as you can imagine-and I couldn&apos;t even get my hand between the top of the radar antenna and the girders on the bridge. But most of the time we had at least six inches of clearance." The canal and its locks are about 50 feet wide, offering plenty of space for boats to pass. The Olsons encountered many canal cruising boats operating under charter. These purpose-built boats were designed with low bridges in mind. The Olsons popped out of the canal into the Hudson River and followed it south to New York City, where they picked up Ambrose Channel, cruised down the coast of New Jersey and turned into Delaware Bay, where Bluejacket found the Chesapeake-Delaware Canal. Once in Chesapeake Bay they set a course for Norfolk, Virginia, and the beginning of the Intracoastal Waterway. Tom and Carol crossed Florida via Lake Okeechobee and left their new boat at Fort Myers, Florida, at the end of October. Their plan was to return in the spring and head for the Panama Canal. However, they investigated reports of robberies of pleasure boats in the Canal area, finding enough truth in the reports to make them abandon the idea of a Panama transit. The following January, they were back aboard Bluejacket, moving north along the west coast of Florida. When they reached Venice, Florida, they set a course into the Gulf of Mexico towards Apalachicola. On the long passage across the Gulf, they saw just two other pleasure boats, but were seldom out of sight of heavy commercial traffic. Later, moving west from Apalachicola along the Gulf portion of the Intracoastal Waterway, the Olsons found the narrow channels wellmarked despite the shallow water. Passing tug skippers were always willing to share local knowledge with them, which was a big help. As in the passage across the Gulf of Mexico, they rarely saw other pleasure boats, and were surprised to find so few marine facilities geared to the needs of cruising yachts. Nearing Galveston, Texas, and the entrance to the Houston Ship Canal, Tom and Carol followed a guidebook&apos;s directions and turned left toward a marina where they expected to spend the night. They found no marina. Instead, they ran aground...twice. Tired, they pushed on and entered the Houston Ship Canal in the middle of the night, surrounded by commercial ships and workboats. They left Bluejacket in Clear Lake, Texas, where a trucker would load the boat and haul the oversized load to Tacoma, Washington. With water tanks drained and fuel tanks nearly empty, she weighed 54,000 pounds as the marina crane lifted the boat onto the truck trailer. The truck driver had to take a lot of back roads on the trip north, because the boat was simply too high to pass beneath freeway underpasses. Olson said the trucker told him the direct route to Tacoma, via interstate highways, was 2,600 miles. Following overpassfree rural America roads, the truck clocked 4,200 miles between Clear Lake and Tacoma. After hearing the tale of bringing Bluejacket home to Puget Sound, I knew she had nothing to prove when we took her out on Seattle&apos;s Lake Union. Predictably, she motored easily and quietly across the smooth water of the lake. 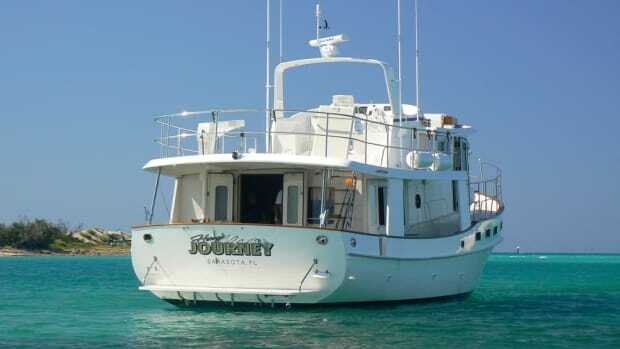 Although they have occasionally cruised overnight with four adults and four children aboard, this is clearly a boat that works best for two people. And it only takes two to handle her. Tom offered me the helm as we approached their moorage, but it was a tight spot with little room for error and I declined the honor. Using the engine and bow thruster to maneuver the boat, Tom guided Bluejacket into her berth as if she were on some hidden track. With a dark blue hull and a glistening white deckhouse, Bluejacket is a standout. There is a certain formal dignity in her classic design, but I think she also knows how to have a good time.